Set for Thursday, July 12, the Pac-12 announced additions to the featured speaker lineup for the 2018 Pac-12 Sustainability Conference. In alliance with the Conference’s new strategic partnership with Unifi, Richard Gerstein, executive vice president of global branded premium value-added products and chief marketing officer for Unifi, as well as Jay Hertwig, Unifi's group vice president of global branded sales, will join the event’s list of distinguished experts. Details regarding the Pac-12 and Unifi's partnership are set to be announced at the Pac-12 Sustainability Conference. 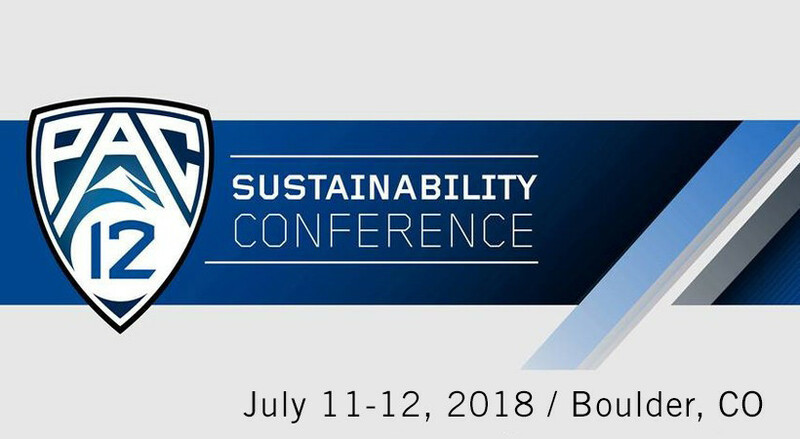 The 2018 Pac-12 Sustainability Conference will take place July 11-12 at the University of Colorado Boulder, with Thursday, July 12 featuring a day-long series of events and speakers. Registration is open online at pac-12.com/sustainability. Special rates for Pac-12 staff, faculty and students are also available. More information, including registration and hotel information, can be found below and at pac-12.com/sustainability. Joni Comstock: As senior vice president of championships and senior woman administrator for the NCAA, Joni’s duties include oversight of 84 NCAA championships. Richard Gerstein: As the executive vice president of branded premium value-added products and global chief marketing officer for Unifi, Richard is focused on the development of sustainability-based performance fibers and brings to the event over 30 years of business and marketing leadership in consumer products, technology and retail. Arielle Gold: As a professional snowboarder, Arielle recently brought home a bronze medal for the U.S. in the 2018 Winter Olympics in PyeongChang, South Korea, in the women’s halfpipe event. Currently enrolled as an undergraduate at the University of Colorado Boulder, Gold is pursuing a degree in psychology with the hopes of eventually attending veterinary school. Mary Harvey: A member of the U.S. Women’s National Team who won a gold medal in Atlanta in 1996 as the team’s starting goalkeeper and previous FIFA Women’s World Cup champion, Mary is also a former California student-athlete and serves as special advisor for the Sustainability at United Bid 2026. Jay Hertwig: As the group vice president of global brand sales at Unifi, Jay brings to the conference nearly 25 years of experience in driving fiber sales and product innovation with global brands and textile suppliers around the world. Steve Lavin: Former head coach at UCLA and St. John’s University, and 2010 Pac-10 Coach of the Year, Steve brings a wealth of experience to the conference with over 30 years in and around Division I men’s basketball, including 20 as a coach and 10 as a broadcaster. Jason Richardson: An NCAA national champion for Michigan State, Jason was the fifth-overall selection in the 2001 NBA draft, playing 14 seasons in the NBA with the Golden State Warriors, Charlotte Bobcats, Phoenix Suns, Orlando Magic and Philadelphia 76ers. Earl Watson: Earl is a former UCLA standout who played for head coach Steve Lavin from 1997-2001 with the Bruins, earning several conference honors before enjoying a 13-year playing career in the NBA and later becoming head coach of the Phoenix Suns, the first UCLA player to become an NBA head coach and first NBA head coach of Hispanic descent. Jamie Zaninovich: As deputy commissioner and chief operating officer for the Pac-12, Jamie is responsible for the Pac-12’s administrative operations, including television administration, sport management, championships, and football bowl relationships. Following on the heels of its inaugural event last year, this year’s conference will continue to represent an elevated approach to enhancing sustainability efforts within collegiate athletics departments as well as an opportunity to design new collective initiatives and share best practices to transform college sports into a platform for environmental progress. Sustainability and athletics professionals from universities nationwide will convene at the University of Colorado Boulder to help the Pac-12 reach the next level of sports sustainability. Fireside Chat - Greening Championships: the second day of the event on Thursday, July 12 will feature an opening fireside chat with several Pac-12 Power Women sharing their leadership insight around greening championships, including Pac-12 Vice President of Marketing, Heather Vaughan, University of Washington Assistant Athletic Director, Karen Baebler and NCAA Senior Vice President of Championships and Senior Woman Administrator, Joni Comstock. #GreenGames: discussion with Arizona State University representatives on how the school is leveraging collaboration with its sustainability efforts and athletics department to reach new audiences. How to support sustainable tailgating: discussion with Stanford representatives on the school’s sustainability efforts around the 2017 football season. Navigating the challenges of zero waste: discussion with 2018 Pac-12 Zero Waste Winner Lin King, manager of Cal Zero Waste at the University of California, Berkeley. Framing the Work: discussion with several representatives on creating lasting programs for sustainable success. Student + Student Athlete Impact on Athletics Sustainability Initiatives: discussion with representatives from Oregon State and Stanford on the success they have seen with harnessing the power of student pride and student-athlete integration into sustainability efforts. Fan Culture: Leveraging New Power, Empathy, Equity & Inclusion to Drive a Sports Sustainability Movement: feature panel discussion with Steve Lavin, Jason Richardson, Earl Watson and Paisley M. Benaza. The Turning Point: Athlete Perspective on The Moment of Truth that Made the Difference: an interview with Olympic athletes Mary Harvey and Arielle Gold.